Understanding liquidity can be one of the more challenging concepts to grasp in matched betting when you first start out. We get asked a lot of questions regarding this concept so we thought we’d help explain ‘what is liquidity’ in this article. To understand what liquidity is, we first need to understand what betting exchanges are. Betting exchanges have changed the way gambling functions and are arguably the driving force behind the huge online betting industry. They also facilitate matched betting so we have a lot to thank them for. When you place a bet at a bookmaker, for example Coral, you are effectively in competition with the company. If you win, they pay out and if they win, they keep your money. A betting exchange works on the same principle, however, you bet against another gambler. Betting exchanges are online marketplaces which allow punters to bet against each other rather than against a bookmaker. They don’t have physical shops like traditional bookmakers and they simply provide the online technology to match gamblers looking to place opposing bets. When there are two people looking to bet against each other, the betting exchange will match them. On either side of a matched bet there’s a back bet and a lay bet. A back bet is the same as backing an outcome like you do at a traditional bookmaker. A lay bet is the opposite, so you’re betting against an outcome happening. Read this article for more information on back and lay bets. Back in 1999, Betfair created the first betting exchange and they’ve grown massively since then. There’s also a great deal more competition these days from the likes of Smarkets and Betdaq. There are a number of reasons why betting exchanges have become so popular in the last 15 years. Until recently, betting exchanges could offer better odds than traditional bookmakers. However, this has changed slightly in the past few years thanks to features like best odds guaranteed. Betting exchanges make money by charging a commission on net winnings. This commission varies between 1.5% and 5% depending on which exchange you use. Traditional bookies make money by offering less efficient odds to the gambler. There’s also more flexibility in terms of what the gambler can bet on at a betting exchange. For example, before betting exchanges were around it was not possible to place a bet against an outcome happening. However, now this a viable option and one that we utilise a lot in matched betting – this is called lay betting, which we mentioned above. There’s also no betting limit at an exchange – only the maximum amount of money waiting to be matched. We’ll come to that next. ‘What is liquidity in matched betting‘ is a very common question. Liquidity is the maximum amount of money a punter can place on any given market at a betting exchange. It refers to both the back bet and the lay bet. If a punter tries to place a bet that’s greater than the liquidity available, the betting exchange is unable to accept the bet. They can only match a bet if there’s money waiting on the other side. So, the liquidity shows the amount of money waiting to be matched. You can see what the liquidity of a given market is directly under the odds for a given market in each betting exchange. Below are the two most popular betting exchanges used for matched betting: You can see the liquidity highlighted in each screenshot. The highlighted liquidity is £9,957 for the lay market (blue) on an England win. Betfair’s page layout is a little more complicated, but the liquidity is still shown below the market price. For the same lay market (pink at Betfair) it’s £5150. Let’s use the Betfair example above. If we wanted to place a lay bet on England NOT to win at odds of 1.36 (the highlighted market) we would only be able to place a bet of £5150 at the time of the screenshot. Whilst you’re very unlikely to ever place a bet that big, it helps explain how liquidity works and what it is. If we placed a bet of more than £5150, our bet would not be accepted or it would be partially matched by the betting exchange. More on this next. In this case Betfair would match our bet with the current available liquidity, £5150 in our example, and wait for more money to enter the market before placing all of the bet. This is called a partially matched bet. The betting exchange will always let you know if your bet hasn’t been fully matched in your bet slip. You’ll have to wait for money to enter the market at the price you bet on. So if you staked £50 at odds of 3.2 and only £25 was matched, you must wait for another £25 to enter the market at odds of 3.2. If the odds are greater or smaller your bet is likely not to be matched. If you wish to, you have the option of cancelling the remaining stake that hasn’t been matched. However, in matched betting this is usually not a good idea unless the odds have changed significantly. It’s best to avoid your bets being partially matched by selecting markets with high liquidity and a large number of gamblers wanting to place a bet. 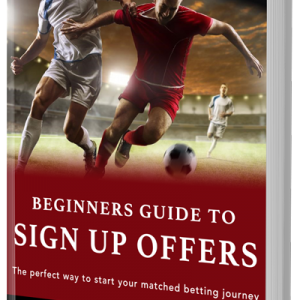 Aim for top tier football markets and large horse racing events for all your matched betting. The liquidity of a market is changing all the time. There are constantly people entering and leaving the marketplace. For more popular markets the number of people betting is obviously going to be higher. As the start time of an event approaches, the liquidity will increase significantly, making it much easier to place our matched bets. This helps us avoid our bets being partially matched. For Premier League games the liquidity is fairly high in the days before the game kicks off where as for most horse racing events the liquidity will only increase within the last hour before the race. It’s best to place your matched bets on horse racing about 15 minutes before the off (start time). This is one of many matched betting tips that help you make maximise your profit from this method. As we mentioned above there are now quite a few different betting exchanges that we can use for matched betting. The main two betting exchanges we think you should consider using are Smarkets and Betfair. Betfair are by far the biggest betting exchange with the largest amount of bets placed. They offer a commission rate of 5% though this can be reduced through their loyalty scheme. Due to the huge number of gamblers who use the Betfair exchange, the liquidity is always very high, even for less popular events. Smarkets are considerably younger than Betfair, however, they’re quickly closing in on the industry leaders. They were founded in 2008 and charge a flat commission rate of just 2%. Our favourite betting exchange and the one that we recommend our members use is Smarkets. However, if you’re looking to place your bets on rare and less popular events Betfair is the exchange to go for. Overall a mixture of both betting exchanges is most effective. It’s very important to keep an eye out for the liquidity of a market when using matched betting to make money online. As we’ve discussed, it’s much easier to place bets on a market with high liquidity over one with low liquidity – our bets are less likely to be partially matched. Stick to popular events and betting exchanges and you shouldn’t have a problem with liquidity. Let me know your thoughts on liquidity in matched betting in the comments section below. Is matched betting still profitable in 2018? Hi Charles, thanks for the blog post. I just had a question about high and low liquidity. I’m currently playing in Germany on a website called NordicBet. I received a 20 Euro “free” bet, although I can’t withdraw this money immediately, but I have to bet it three times. Somebody advised me that I find a bet on an exchange website with high liquidity, but I don’t understand why this is necessary. If I bet the money with normal back and lay bets, everything should be fine, shouldn’t it? Why do I need to consider the liquidity of the back and lay bets? I hope you understand the problem and I welcome any advice you might have. Thanks! Hi Greg, thanks for the comment. Ok, so you’ve got a rollover of three times. It doesn’t matter what the liquidity is, as long as there’s enough to place your desired bets. It’s not like you’re wagering £1000s, so you should be absolutely fine. The only time you need to consider the liquidity is when and if you’re placing bets on rare markets with a less popular betting exchange. But that’s unlikely in your scenario.